As your collections have been growing, one of the common questions coming into us has been about how to share locomotives between routes both in terms of computer-controlled trains as well as being able to use them yourself. 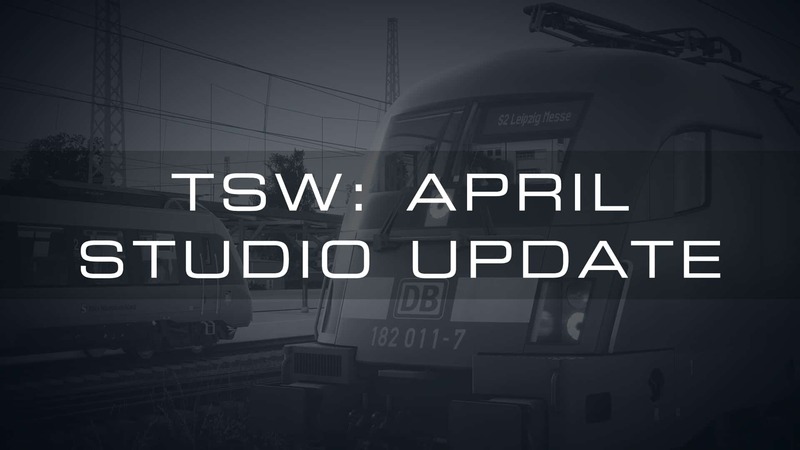 For this weeks Studio Update I took Matt Peddlesden (Senior Producer of TSW) to one side to find out how this works in Train Sim World. Hi Matt, first up, can you just confirm whether it’s possible to use locomotives from one route or locomotive pack on different routes currently? Yes, it absolutely is. One of the earliest examples of this was the GP40-2 Loco Add-On that originally launched for the CSX Heavy Haul route. It’s been possible to use that (and see it in AI trains) on Northeast Corridor: New York as well. What other good examples of sharing stock can you tell us about? The most recent example was enabling Ruhr-Sieg Nord locomotives to be used on the new Main-Spessart Bahn route and vice versa. So for example on Main-Spessart Bahn you have a series of services that are available for the included BR 146.2 and BR 185.2 locomotives. When you go into service mode, however, you will see that the BR 143 is offered as well (if you own the Ruhr-Sieg Nord route of course). The BR 143 can run passenger services and a small selection of freight services due to its lower power. Similarly, you’ll find that the BR 185.2 in Railion livery is now available in your service mode locomotive list back on Ruhr-Sieg Nord as well! How does this actually work internally? I will preface this answer and probably the rest of this interview with a note that i’m going to be talking about concepts within the game and within the editor and the upcoming tools, just to be clear. When we build consists, or “formations”, in the editor they are defined in a straightforward way with each rail vehicle being added as required. For each locomotive we can enable substitution to be considered as an option and suggest the percentage chance that this will happen. Additionally, a set of requirements are defined to ensure that only an appropriate locomotive is ever considered. Let’s take an example. Our formation has 1 freight locomotive hauling 2000 tons. It’s set up so that it accepts substitution by another German Freight locomotive that has a minimum tractive effort of 5000 kW. When we run the sim next, the system will identify that this can accept substitution, review all the locos in your system that meet the criteria and then pick one. In this case a BR 185.2 or a BR 182 would be eligible to be selected but a BR 143 would not. Substitution allows you to choose different locomotives to run services yourself via the loco selection screen in Service Mode. It also allows the other trains you see driving around to use different locomotives as well. The key aim from this approach is that service mode will gradually evolve as new trains are released (whether as loco packs or as part of route packs), so as you expand your collection you should find service mode becoming richer with content. One of the common requests we get is to bring trains like the Class 47’s and the Class 45 over to Great Western Express. Is that something Train Sim World can do? There is technology in the game to support this now but it’s only very recently been added. The key challenge with these kind of trains for GWE is that they are loco-hauled services and GWE hasn’t got any of those in its timetable. Considering solutions for this started out around the idea of having services simply hide themselves if their required stock wasn’t available, for example. Our end solution for this was to implement a layering system. The main timetable that comes with a route will be in the base layer and will use all the stock that comes with that package as you’d expect. We can then add additional layers which have more services that use stock in other packs, so the West Somerset Class 47 services would simply be in their own layer of the GWE timetable. Let’s take the new BR 182 loco pack as an example. It runs natively on the Rapid Transit route in reality and that’s where the scenarios will be based, but it’s a loco with coaches and therefore can’t substitute in for the existing Talent 2 EMU. This is where a new layer comes in. We have created a new layer with about 60 or so new services and then linked its usage to the presence of the BR 182 on your system. The end result is that if you don’t have the BR 182 you continue with just the Talent 2, but when you purchase the BR 182 you’ll get another 60 or so additional new services showing up mixed in with the Talent 2 services making for a richer and more engaging environment. If you later uninstall the BR 182 you’ll see those services simply removed from the list. That sounds incredibly powerful, does that mean new services automatically appearing anywhere that they should? Not necessarily. All of these new layers are new bits of content that must be designed, authored and then tested. The same is somewhat true for substitution, as we add new locos some of them will automatically slot in and in some cases we may need to adjust tags to make better use of vehicles. We’re committed to expanding the service mode experience and always looking to add to that gameplay however. Will content creators using the TSW Editor be able to add layers to DLC timetables? No, since you need to add the layers right into the main timetable file itself it won’t be possible. If you make your own timetable for your own route, however, the functionality to use this is all present and available. Currently it is also not possible to have more than one service mode timetable for a route so this is going to be limited to your own routes, but we’re aware of a strong request from everyone to expand this, so we’re looking into options. We’ve talked a lot about locomotives, what about wagons? The substitution system works with all rail vehicles. When you set up a formation in the editor and start setting up substitution rules, you will tell it what kind of vehicle it can be swapped with (e.g. locomotive, wagon, coach) and it will search within that subset. There are also some clever settings where you can let the substitution system dynamically rebuild chunks of a train using the available wagons. If you look at some of the CSX Heavy Haul services again and run a few of the ones showing mixed manifest trains you’ll find that each time you start the same service the wagons behind you will be different. It’s not just a random swap-out either, in reality you’ll often find say 3 of one kind of wagon followed by 6 of another and the system can be set up to create randomisation at that kind of level as well. A little insider knowledge - on CSX Heavy Haul, all those manifest freight trains with mixed wagons are actually set up internally with just a long string of autorack wagons and then they use the random substitution feature to swap them in to a nice randomised manifest consist automatically! This all sounds really great in adding more variety to the routes our players are most interested in. How would our players go about doing something completely ridiculous like driving the Class 101 over Main-Spessart Bahn, if that's something they want to do? That’s not something you can do right now within the game. For service mode substitution and layering we’re focusing on expanding authentic experiences by adding trains as options in the appropriate places that they run in reality. Once the Editor comes out you’ll be able to easily create your own scenarios to place any vehicles on any route. We see a lot of requests from players wanting more freedom within the game however and this is something we’re looking at options for the future. Simple substitution allows for a locomotive to swap in for something like-minded without specific authoring and this working right now in some routes. Additional Timetable layers allow for entirely new services to be added such as to bring Loco hauled services to Great Western Express or Rapid Transit. so a new layer can then itself benefit from simple substitution, so for example, if the Leeds Manchester 47 was working on Great Western Express, it could be itself substituted out for the Leeds Manchester Class 45 creating even more options for variety. You mentioned the BR 182 earlier, it’s an exciting locomotive that is getting some great feedback, however, many people have asked about whether the Rapid Transit route might be seeing some updates as part of this. Definitely. We heard the community’s constructive feedback, loud and clear, so the team are already engaged with some fairly major overhauling of PZB and all the signalling on the line. The full changelist will come out nearer to release but I can certainly confirm that PZB and signalling are getting a lot of attention at the moment. We’re also going to review the Talent 2 and its PZB implementation along with a couple of other issues that have been reported such as the screens sometimes ceasing to update. Does substitution mean that we might see the BR 182 on any other routes? While we’re using the BR 182 on the Rapid Transit route as a Passenger locomotive, they also perform a strong freight role on routes like Ruhr-Sieg Nord and Main-Spessart Bahn so we are hoping to bring the loco to these routes as soon as we can in that capacity. In order to do this we need to just get one more new bit of tech in the game however! Currently one of the fundamental rules of substitution is that you can only ever substitute a vehicle that is the same size or smaller because otherwise it might not fit in sidings or be able to complete reversing movements correctly. The BR 185.2, which forms that “base” locomotive for all freight operations on these two routes, runs to a length of about 18.9 meters. The BR 182 however runs about 40 centimetres longer at 19.28 meters! The tech is done we just need to get some further testing in and finalise the setup on both routes and the BR 182. I’ll have more details on this later! The usability of the current crop of German trains across the three routes is looking great, as you can see from this overview chart showing which combinations work together. Going great! We’ve been able to successfully deploy the full dev kit up to the Epic Launcher, grant access to it to a group of closed beta testers and they’ve been busily using it and providing some feedback to us on their experiences. I’m delighted to say that the feedback is very positive and there have already been some great successes in terms of learning how to create, package and share scenarios as well as starting to learn the much more intensive process of route building. We are still a way off a public beta yet however the recent milestones have provided significant confidence that it’s definitely evolving away from being our internal tool to something available for anyone to use. Following that success we have been re-integrating all the changes to the public editor back in to our internal version, our ultimate goal being that we’re all using the same editor and we’ll certainly have this completed before the public beta launches. We want you to use the same tools we’re using and it’s great to see that our closed beta testers are already able to grasp them and start creating interesting content almost within the first couple of days of getting access.